In a number of posts I wrote about finding the right balance between our work and private life. This is a challenge in a "normal" office job, but certainly when working in the field, with your family thousands of miles away. Finding the right balance in life is so difficult to achieve that some people choose it as their sole undertaking. A common mistake made by many though is to think that the perfect balance is an absolute concept. However, some large organizations are sensitive enough to give their employees the opportunity to experience this concept first hand. 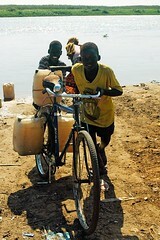 Working in a remote location in South Sudan, today was “one of those days” when you think something is seriously wrong. Here is the deal: I am in charge of a humanitarian operation that covers an area in South Sudan, which is five times the size of Denmark. The country is amazingly challenging with little or no infrastructure and lots of insecurity. Luckily things only turn real bad during the rainy season. Unfortunately, the rainy season lasts an average of 8 months a year. The very few roads are impassable. The airstrips turn unland-able and the country becomes one big swamp. It gets so bad, that a long sunny spell is what most South Sudanese pray for and what can make the difference between life and death for those waiting for food aid and other relief items. 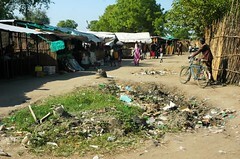 The floods destroy harvests and paralyse the little commerce that shyly emerges during the dry season. The conditions are so bad that some areas become impenetrable islands where its unfortunate residents might take weeks before they can move out, and this happens to humanitarian workers too. You start your day taking a radio call from one of your food monitors out in the field, informing you the airstrip where we were to pick her up, was not landable and that she’d run out of food supplies and water. Another staff member calls in via the radio, asking for a tractor to rescue his vehicle which had got bogged down 100 Km from their final destination. While organizing help for the teams in the field, one of your staff kindly reminds you he hasn’t been paid for the past two months -quite common in a place where banks do not exist-. His gentle reminder is accompanied by the stern annoyance of your security guards, who are still waiting for their new contract and never miss an opportunity to remind you they were good at shooting before the South Sudan peace treaty was signed. Your life immediately becomes second priority when a kind man tells you that we only have five drums of fuel left to run the vehicles and generators, without which your operation will stop. Which reminds you, you should really start working on finally getting your admin, finance and human resources assistants recruited ! Ten minutes later, a director general from one of the nearby ministries is at your door asking for tents so he can relocate his flood-affected family to higher grounds. While still keeping a smile and dealing with some of these adversities, you are suddenly reminded of the urgent need to go to the bath room. The nearest latrine is two kilometres from your office, though. “Never mind”, you think, “Lunch time is in a few hours, I will go then.” Meanwhile you stay away from the river water that you’ve found in the office water dispenser. *%$$£ ! This is about the time, you hear shooting in the vicinity of the office, and as the UN security area coordinator, responsible for the security of all UN staff, you are compelled to do something. By 11 am, you fake a big smile, and remember that your landlord wants to kick you out of your current premises. And the governor wants to turn your best warehouse into a prison. Meetings to be held! Just as you realize there is no vehicle to go for lunch (and to the latrine! ), you remember it’s Friday and your weekly sitreps are due. While you try to forget the urgency of nature’s call, you are reminded by Email to do a bit of planning for the next food distribution, and you are trying darned hard to figure out how on earth you’re going to recruit 40 people. Before you know it, you realise it’s already 6 pm and mosquitoes will soon start looking for you. Then again, you remind yourself you are a humanitarian worker and that suffering is part of the job. So shrug and look one more time at your in-box trying to figure out which of the last 50 unread message deserves your attention. “The time for submission for the peer support focal point is due today”. You think this would be ideal work for your HR assistant. If only you just had one..
“the deadline for the UN Module on Prevention of Harassment, Sexual Harassment and Abuse of Authority in the Workplace is due by the end of the month and is mandatory for all staff.” You are glad that somebody reminds you of those important topics that often get overlooked by operational people. But then you remember that 60% of your staff is always in the field, distributing food in remote locations where only radio connectivity is available. Another 20% only speaks the local dialect, which unfortunately is not included in the five United Nations official languages of the “harassment module”. And the remaining 10% of your staff, is stuck in the mud of the rainy season somewhere waiting for you to pull them out. “Next year’s budget submissions are due tomorrow.” You know that you’ll never make it and without this you are doomed. Wait! One more message to read: your wife and kids remind you how much they miss you and that your place is at home with them. You are about to reply telling them that your supervisor asked you to postpone your leave due to an unplanned important event, but that would be too much in one day. Just after midnight, you switch off the light and promise yourself that the following day you’ll figure out the meaning of all this and that you will soon find a better balance.